How Much Money to Charge for a YouTube Video Sponsorship? With the emergence of influencer marketing, more YouTubers get the opportunity to receive sponsorship inquiries. This opportunity has left a lot of questions in the heart of YouTubers one of which is pricing. A lot of YouTubers are wondering just how high they can charge in a bid to make the profit and still ensure they do not lose the sponsorship opportunity. In this article, we will be discussing some ways to determine how to set YouTube Sponsorship Prices. Before we go ahead, let’s discuss the factors you need to consider before setting your YouTube Sponsorship Prices. The Subscribers: the number of loyal subscribers your YouTube channel can boast of is a determinant of how much brands will want to pay for running an ad with you. This is so because your subscriber base is a measure of ASSURED publicity they (brands) will get for running and advert with you. It is, therefore, a good idea to build a strong subscriber base through quality works even before sponsorship opportunities start coming in. The Average Video Views: video views are taken into consideration instead of total subscribers because, while the latter is a measure of your fan base, Average Video Views is a measure of reality on your YouTube Channel. It shows exactly how many people view your YouTube Channel’s posts. Therefore, it is a better indicator of the number of people that will see a product you influence in your videos. Brands prefer Influencers with high engagement and you should always work towards not only building your subscriber list but also garnering more views for your post. You can easily calculate tour Average Video Views by getting the sum total of views you’ve gotten for the last ten (10) videos you uploaded and getting the average. Avoid using statistics that are consistent with your regular channel metrics i.e. a viral video with about two (2) times your regular video view, below is not enough statistics to base pricing on. e.g. 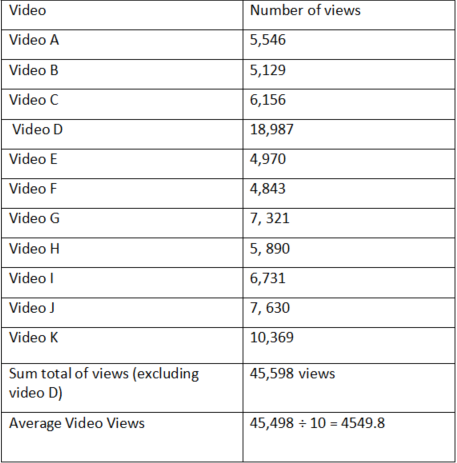 including Video D instead of K in the table below will spike the average view to 7320.3, which is a rare metric stat considering other videos. Video Engagement: this is a measure of like and dislikes; favorites, comments, shares and annotations you get on your channel. How positive your engagements are will help you determine how much it is worth to advertise on your YouTube channel. One tip about keeping your video engagement topnotch is maintaining your video retention rate and this is best achieved with videos that are of average length i.e. 30-90 seconds in length. You can view your video engagement report in the analytics tab located on the right-hand side of the YouTube channel interface. The main topic of your channel: how relevant is your channel to the sponsors’ brand? Taking the relationship between your focus Niche and the Sponsors’ brand is important. There is logically no cosmetic brand that will spend so much to place an ad with a YouTube channel focused on bags when there is a general fashion or even a cosmetic vlogger who assures a better return. Finally, how do you determine the price for a sponsored ad on your channel? There are several ways of determining the price of a sponsored ad on your channel. However, this post will only be discussing a few of them. Skippable video ads: also known as True view ads, are ads which can be skipped after playing for just five minutes. These ads are only paid for when viewed for more than thirty (30) seconds. It is subdivided into two: in-stream ads and discovery ads. Non-skippable video ads: like the names imply, these are ads that cannot be skipped and the viewer has no choice but to watch it to the end. They have a length limit of 15-20 seconds maximum. Bumper ads: these are also non-skippable ads which last for only six (6) seconds max. Overlay ads: this is ads which are displayed somewhere on the video interface. It can either be text or image-based and can run for as long as the video length. Display ads: this is ads that appear above the video suggestion list. It can either be in form of a banner or a video clip. Sponsored cards: these are pop-ups that appear on a YouTube player. They in no way obstruct the viewer’s line of sight and only expand when clicked. They appear as a small information icon accompanied by a text CTA which appears upon mouse over. Use NoxInfluencer channel calculator: the NoxInfluencer channel calculator is a web-based template which can be used to calculate how much you can charge from a prospective sponsor. You only have to input your total number of followers, Average Number of Views and Estimated Channel Value. Finally, it is of utmost importance to evaluate the price of a prospective sponsors ad after taking all factors into consideration. However, it is also necessary to be on the average side when placing your price as you definitely don’t want to scare them off before going into partnership with them. Prev How to Generate Revenue from YouTube as an Influencer?